Today I’m praying for all my awesome friends who are reading through Your Word together this year. What a blessing they have been to me and how much You must love seeing their shining faces absorbing truth. Be with us today; revive and recharge us and may we continue to glorify You through this challenge to continue reading the Bible each day. Friends, if you’d like to add a prayer for one another that would be an awesome way to continue lifting each other up! 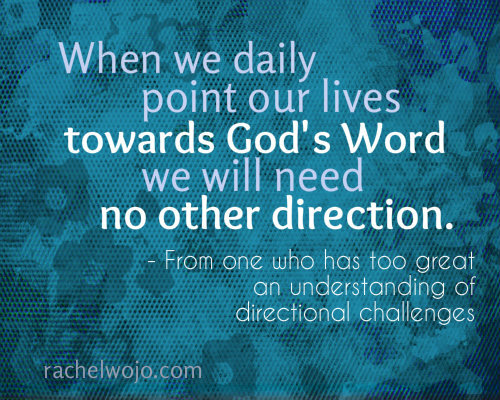 When we daily point our lives towards God’s Word, we will need no other direction! My prayer is that as we continue to read God’s word that we will be a better witness for Him! May we be lights in a dark world. oh girl. no problem at all. Thanks for praying! Father I lift my sisters in Christ up to you I pray that your word will soak into them. That through the reading of your word what they have absorbed in will shine out to others around them. I pray a blessing on them and their families. Reading this week was very challenging and thought provoking. Genesis 12:1 “And the Lord said unto Abram, Get thee out of thy country, and from thy kindred, and from thy father’s house, unto a land that I will show thee. ” I read further and according to this verse I felt that Abram was not totally obedient to the Lord in that he took Lot with him when he left. Others have said that is not so because Lot was his responsibility, therefore he was exempt…like a son as Lot’s father was dead and was Abram’s brother therefore Abram assumed fathership for Lot as their culture required. My question is what is your definition of “Kindred”? Is that family or not? If it is family then was Abram disobedient in not leaving his family behind? Looking back this evening I am thinking that perhaps I might have put too much emphasis on Abram’s obedience to God’s command, and missed another important point. Does anyone think that the point of this whole command of God was that He was trying to teach Abram complete dependence on Him by telling him to separate from his Kindred in that when he left them behind he would no longer have any visible means of support ,and would have to listen carefully to what God told him? I’m wondering if that was the whole point here. Any thoughts about this? I’ve typically had that thought when I’ve read over this passage. As someone who hasn’t lived close to my family in years, I can tell you that it sure does make you trust God more when you can’t zip across the street for Mom & Dad’s advice. 😉 Thanks for sharing your thoughts as we’re reading through!